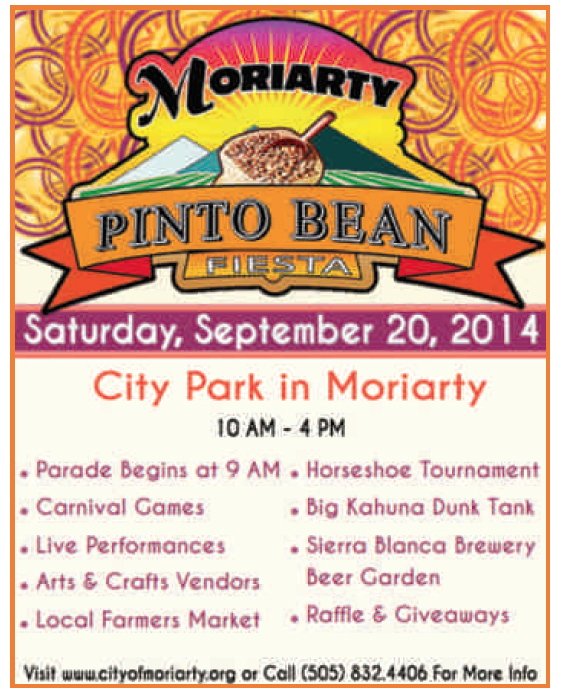 Moriarty Pinto Bean Fiesta on September 20 at 10am! Moriarty Lion’s Club Annual Pancake Breakfast – monies raised will go to the Lions Club. Starts at 7am at the Lions Building in Moriarty. 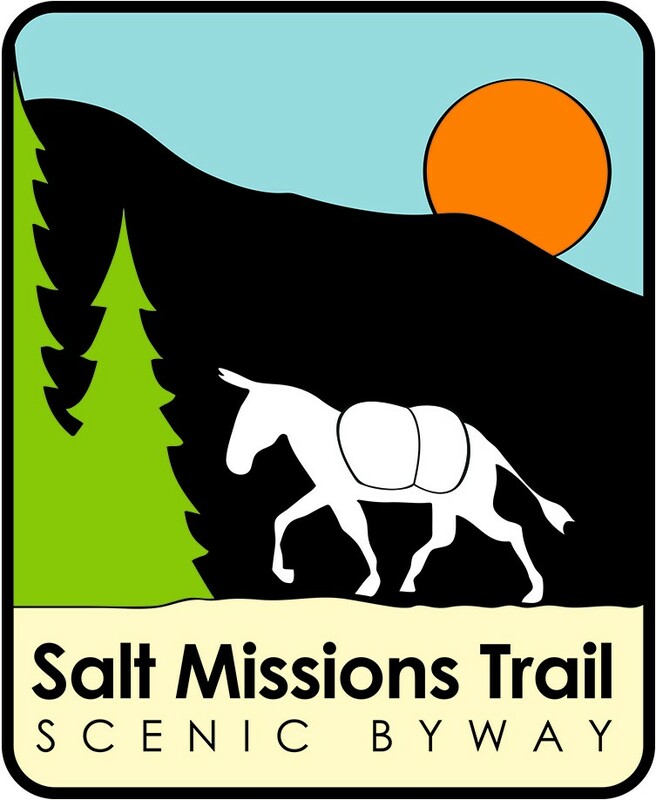 For more information call Don at 505-832-6330 or 505-410-1369. 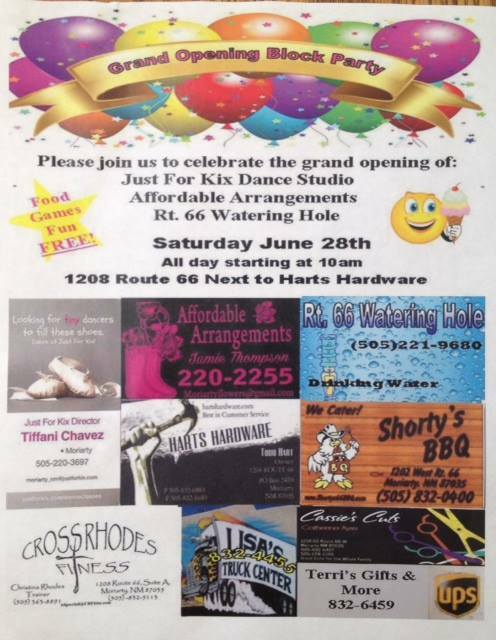 Route 66 Arts Alliance hosting Art Show – 9am to 4pm at the Moriarty Civic Center. For more information contact Sandradrasilk@gmail.com. Live music, volleyball tournament and fishing derby at Arthur Park on July 4th. The pool will be open from Noon to 4pm. On July 4th at 11am, there will be a barbecue lunch at Chavez Park hosted by the Mountainair fire department. There will be games, water polo, music and vendors. A fundraiser Italian dinner will be held at the Bakery at 6:30pm on July 4th. Funds will go toward Mountainair’s animal control fund. For more information call Barbara 505-506-1415. On July 4th at 4pm, there will be a poker tournament at the Dr. Saul Community Center followed by a pie auction at 6pm and a dance from 8pm to Midnight. On July 5th there will be a pancake breakfast at the Shaffer Hotel dining room from 6-8am. It costs $6.25. 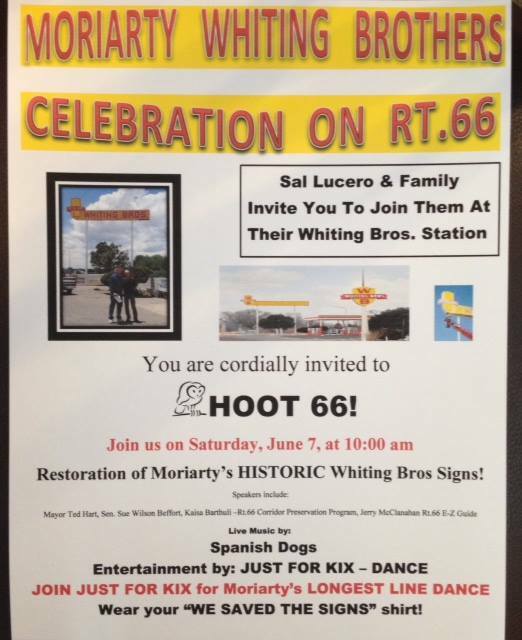 The Route 66 Arts Alliance is sponsoring a Holiday Art Show at the Moriarty Civic Center on July 4 from 9am-4pm. Vendors wanted. For additional information about being a vendor, please contact Sandra at sandrasilk@yahoo.com. RETRO 66 – Relive The Route Committee created a mural artist database of murals in Moriarty, Edgewood and Tijeras. This database will be distributed to Chambers of Commerce, the RETRO facebook page and webpages. 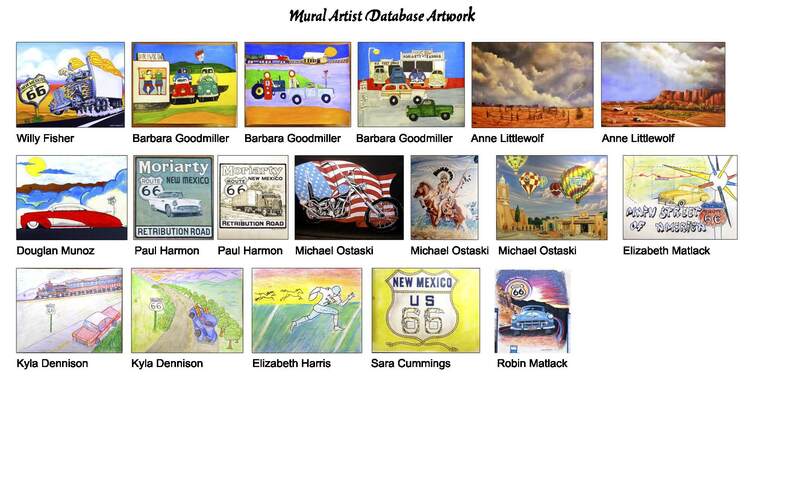 If you have a mural to be considered for the database, please contact Sherry Abraham at edgewoodsherry1@gmail.com with your contact information, a representation of your work and a website or facebook link. The Festival of lights parade and lighting of Crossley Park will be held on December 6, 2013, at 5:30pm in Moriarty. For more information, please call 977-4270 or 832-4087. The Village of Tijeras Christmas tree lighting will be held on December 7, 2013, at 6pm at Luis Garcia Park. There will be caroling, hot chocolate and biscochitos. For more information, please call 281-1220.